The blood-soaked tale of a Norse warrior's battle against the great and murderous troll, Grendel. Heads will roll. Out of allegiance to the King Hrothgar, the much respected Lord of the Danes, Beowulf leads a troop of warriors across the sea to rid a village of the marauding monster. The monster, Grendel, is not a creature of mythic powers, but one of flesh and blood - immense flesh and raging blood, driven by a vengeance from being wronged, while Beowulf, a victorious soldier in his own right, has become increasingly troubled by the hero-myth rising up around his exploits. Beowulf's willingness to kill on behalf of Hrothgar wavers when it becomes clear that the King is more responsible for the troll's rampages than was first apparent. 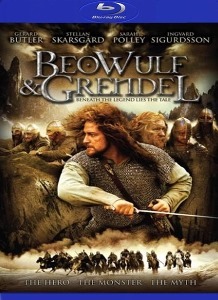 As a soldier, Beowulf is unaccustomed to hesitating. His relationship with the mesmerizing witch, Selma, creates deeper confusion. Swinging his sword at a great, stinking beast is no longer such a simple act. The story is set in barbarous Northern Europe where the reign of the many-gods is giving way to one - the southern invader, Christ. Beowulf is a man caught between sides in this great shift, his simple code transforming and falling apart before his eyes. Vengeance, loyalty and mercy powerfully entwine. A story of blood and beer and sweat, which strips away the mask of the hero-myth, leaving a raw and tangled tale. I was interested to see this as it sounded so intriguing and although it does achieve to some degree (with the help of the vast Icelandic terrain) I think overall it falls somewhat short of its potential. I was still entertained but my appetite was whetted for more of the mythology based plotlines - it seemed to meander a bit in the middle. I craved for some big, ugly monsters. I suppose it was a case of being accurate to the original epic poem - kudos for that. 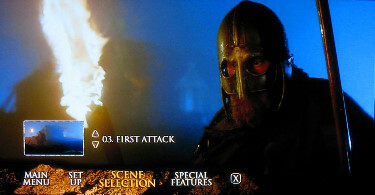 It wasn't as violent as advertised (I didn't think) and character development could have been superior, but its biggest plus was the environment, costumes and performances - it really did capture a realistic visage of the six century - I thought (although, did they use the F-word back then?). Perhaps my expectations were escalated by the description and I've been jaded by overblown Hollywood-esq tales of heroes and villains. 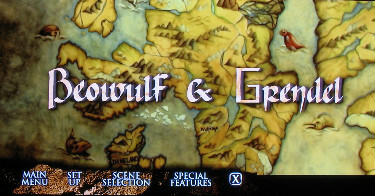 To its credit, the production didn't utilize CGI based special effects. By no means do I think this is a poor film, but I think it could have really achieved to a huge niche following if certain plot points were accentuated and developed - almost giving birth to a new genre. 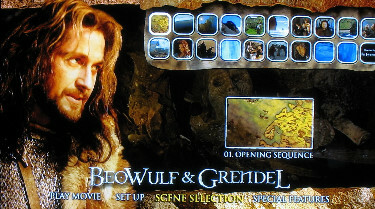 Nevertheless, Beowulf and Grendel can keep you entertained with its visuals and suspense. With the benefit of the cinematography and fabulous barren vistas the image looks exceptionally impressive at times - sharp with intense layered colors. I haven't seen the SD edition but can make a fairly easy assumption that this image blows it out of the water. The BRD does the things we have come to expect from high-definition although I never witnessed any unique depth to the picture quality. There were no visible artifacts even though there were some large mono-colored sky and land shots. I saw no evidence of manipulation although some of the colors (grass, sky, water etc.) looks almost too pure. Bottom line I might give this about 7.5/10 and am fairly happy with the first hi-def effort I have seen from Anchor Bay. This bodes well for future BRD releases from them. Comes in two flavors - 'only' an English Dolby Surround 5.1 or a PCM 5.1 track. Quality was good - and it was tested a few times - nothing window shaking but some trollish grunts and yells could make the hair on the back of your neck arise. 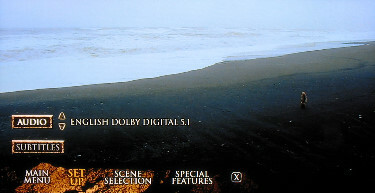 The audio track wasn't a huge part of the film expression. Optional English, large subtitles in an ugly yellow font support most the dialogue (but not some quasi-Danish/English verbiage ?). The film is almost entirely in English, very clear and clean, so they are really not that necessary. A fairly light commentary with director Sturla Gunnarson, screenwriter Andrew Rai Berzins, Wendy Ord (first assistant director ) and Debra Hanson (costumes). It was a nice balance of production information, both amusing and technical anecdotal information, plus the development impetus behind the film. I enjoyed it and I got to see the film again. Also included are some storyboard sketches and an impressive hi-res trailer. BOTTOM LINE: If you are going to watch this film - this is the manner (aside from theatrical) you will want to choose! It looks and sounds most impressive. Just don't do, as I, and get your expectations too high on the form of the narrative. It's not as fantasy-like as many may have expected, or hoped, but it is still worthwhile watch. So that's sort-of a recommendation.